Javier Fortuna’s fight with Abner Cotto was sloppy, comical and ugly––if it’s possible to be both ugly and comical at the same time. The horrific performance from referee Lou Hall, who was officiating his first significant career fight, only added to the mayhem, chaos, and havoc. Fortuna (26-0-1) buzzed Cotto (18-3) early in the first and second rounds, but Cotto hung in and even scored a “knockdown” in round two with two of the neatest back of the head rabbit punches ever thrown. 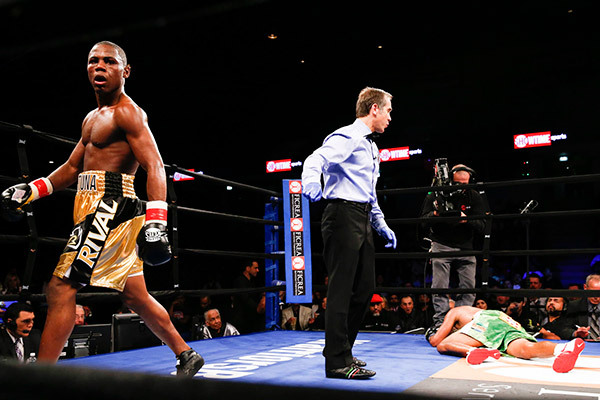 Hall called it a knockdown which it was not and then took a point away from Cotto for the knockdown. Huh! Cotto began to find a rhythm, moved forward, and used some debilitating low blows to torque things keeping the novice Hull busy. Then, at the end of round four, Cotto followed Fortuna to his corner to aggravate him and Fortuna threw a late (after-the-bell) shot that missed Abner completely. At this point, Cotto’s trainer ran into the ring and instructed his fighter in plain sight to hit the canvas to show the “delayed” impact of the miss. Thus, the Puerto Rican cousin of Miguel Cotto slowly lay himself down badly “hurt” at which point Hall decided to take everyone’s word for it and issue a point deduction from Fortuna. This was just plain sickening to watch as Cotto will never make it in the theater. Finally and thankfully, Fortuna had enough and finished Cotto off halfway into the round with a one-punch knockout. They used to say that bomber Bob Satterfield could hurt you even if he missed. Sadly, the only thing Cotto hurt was the proud Cotto name.